The artist on SHADOWLAND talks about working on the storyline with Andy Diggle and shares some sketches for his wraparound cover to issue #1! Many thanks to Mr. Tan! Kuljit Mithra: Even before SHADOWLAND was officially announced, your name had been attached to the project through the internet rumour-mill. Seems like it was a long time ago. When had you signed on for the series, and what had most excited you about getting the chance to work on it? Billy Tan: Gosh, that does seems like a long time ago. I believe I was still working on NEW AVENGERS when editorial came to ask me if I would be interested in the mini-event project. I didn't have much information about what the book was about, aside that it would be street level and centering around DD. I signed on when I learned about other characters that would be involved in the book. 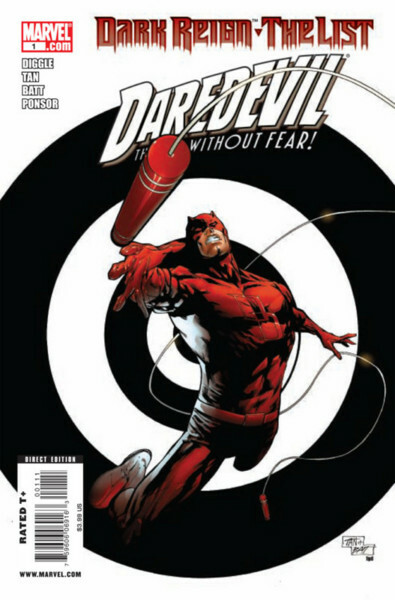 Mithra: Had you ever drawn Daredevil before in any other title for Marvel? What had been your opinion of the character? Tan: I have not drawn DD in any other title before. I didn't read many DD titles before I started on the project either. DD is cool in a way that he doesn't have any super power and has to rely on his senses and martial art skills to fight crime. That makes him a little more ordinary and relatable than his super powered friends. Mithra: While not officially branded as part of SHADOWLAND, the DARK REIGN: THE LIST issue was technically your first issue for the series and you got your first taste of drawing Bullseye and The Hand ninjas, and the supporting cast. It was also your first issue with Andy Diggle. Does he write full script? Was there anything in terms of your collaboration that started working well as you both worked on SHADOWLAND? I mean as scripts started coming in, were you starting to understand each other's strengths? Tan: Andy does write full script. Many writers will try to write to the strengths of the artist they are working with while not compromising on the stories they intend to tell. I think Andy knows that I enjoy drawing action scences so he does incorporate a good amount of actions in his story. The first book I had read from Andy was the SILENT DRAGON and thought it was a beautiful book. I was really glad to have a chance to work with him. Mithra: One of the things I noticed was that you had Batt and Victor Olazaba on inks, and you also inked some of your work. Do you prefer to ink your own work? Tan: I do actually enjoy inking sometimes. It's relaxing for me and gives my right brain a break. However, in order to produce timely and good quality work, a good team is needed. It's very difficult for one person to do it all and that's where Batt and Victor comes in to kick it up a notch. Mithra: With stories like SHADOWLAND, I often wonder how artists keeps track of all the characters and coordinating the panels with fights and then the "talking heads" panels. How did you keep track of who goes where, or even what costume they were supposed to have? You even had to coordinate with multiple tie-in comics too. Tan: For the most part, the editors will provide me with the guide for the current costumes involved. However, I still sometimes find myself putting on a wrong mask for a charater and had to redo them. Like you said, it's difficult to keep track of them all. Although not often, artists do make mistakes. In term of coordinating panels, writers are normally very clear with what goes on which panels. 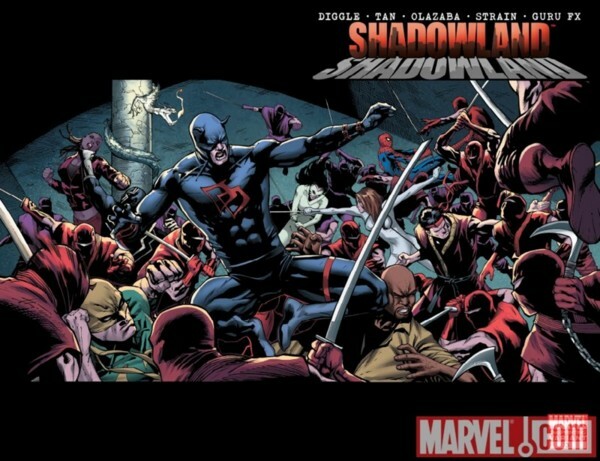 Mithra: Your cover for SHADOWLAND #1 is great (I have the oversized poster framed in my office). As I mentioned before, I don't know how you'd even begin to design a cover like that with so many characters. How many sketch ideas had you come up with? Was there anything you had to change once you drew it (due to editorial)? How long did it take you to draw? 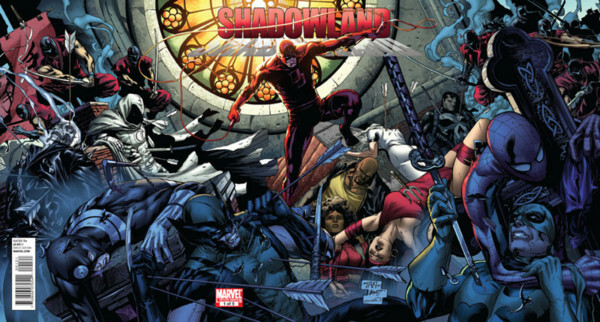 Tan: I believe editorial initially wanted a single iconic cover of DD standing over other fallen heroes. I did a sketch with that idea and wasn't happy with it at all. I then made it to a double spread but still didn't feel the impact for the scene. The third try I made it to a 3 pager and finally I got the "Yah" feeling. I've sent you some of the initial sketch ideas. Mithra: The ending of SHADOWLAND #1 was shocking, but I felt the impact of it was lessened by all the promos and teasers Marvel released beforehand. How did you feel about how the series was promoted? 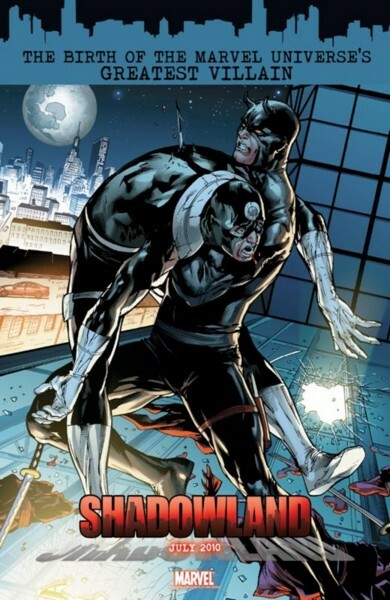 Mithra: As Daredevil became more influenced by the Beast, your representation of DD became more demonic and his arms and legs were drawn even longer than normal. Was this a conscious decision on your part? Tan: Yes. Definitely a conscious one. The editorial was thinking of a Hulking demonic DD but I thought that DD would feel too bulky and heavy. I want to make him creepy yet retain his agility. Mithra: Were there any favourite characters you liked to draw in the series? Tan: Not really. They are all fun to draw except for the ninjas. It felt repetitous after the 20th ninja. Mithra: I'm not sure how closely you've followed online reaction to the series... it seems people really liked it or just couldn't get into it. How do you feel the series was received and how was it for you personally and professionally? Tan: I do follow some of the online blogs. Personally I enjoy the ride of this series. The book is packed with actions and funs. It's kind of like a Bruce Lee movie with our street level characters. I have always try to do the best I could. The readers will the final judge whether my effort is good enough. I appreciate all the positive and constructive feedbacks. Mithra: And the final question... SHADOWLAND is done... what's next? Are you going to concentrate on an existing series, or mini, or even your own creations? Tan: Right now, I am not sure which project I will do the next. Hopefully, there will be some news coming soon.